Poor Santa Claus. This live-action feature finds his sleigh stuck in the sand on a Florida beach only days before Christmas Eve. He psychically summons prepubescent aid from a nearby subdivision. In order to extricate Santa's sleigh, the local children bring many different animals (presumably the sheep was someone's housepet), but nothing works, and the kids are afraid they won't get any gifts this year. To boost their spirits, Santa tells them the story of Thumbellina, and the setting dissolves into a "fantasy within a fantasy". Thumbellina is a beautiful but very tiny girl, "not much larger than a clothes pin". She becomes lost in the forest during the winter and finds refuge in the underground home of Mrs. Mole. A neighbor mole, Mr. Digger, falls in love and wants to marry Thumbellina, but she's having none of it. When warm weather returns, she runs back into the forest and deserts the two kindly creatures who saved her life, crushing their spirits forever ... the end. As Santa is finishing his story and yes, that is its intended conclusion he and the children hear the wail of a siren. 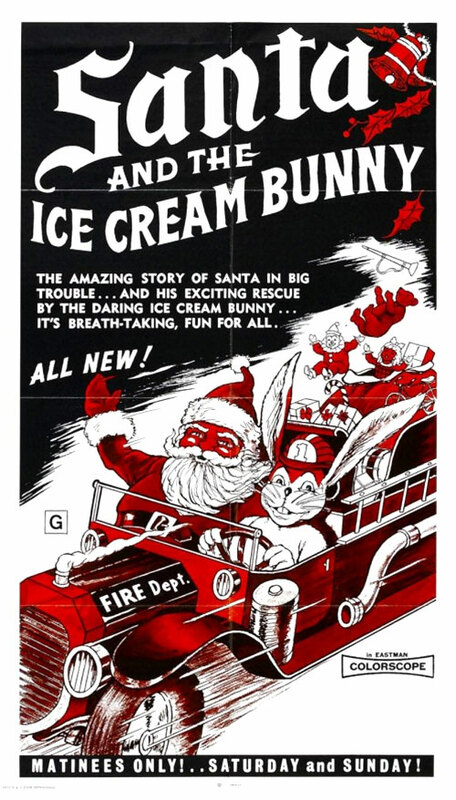 The "Ice Cream Bunny" has arrived in his antique fire engine to save the day! 0 Response to "Santa and the Ice Cream Bunny (1972) R. Winer"